323 Marlborough is located on the north side of Marlborough, between Fairfield and Gloucester, with 321 Marlborough to the east and 7 Gloucester to the west. 323 Marlborough was designed by architect Frederic H. Moore and built ca. 1873, one of two contiguous houses (321-323 Marlborough) of the same design with brownstone façades. 321-323 Marlborough were built for building contractor Samuel Tarbell Ames, two of five houses at the northeast corner of Marlborough and Gloucester that he built at about the same time for speculative sale. The other three, at 3-5-7 Gloucester, also were designed by Frederic H. Moore but with brick façades. On February 13, 1873, Samuel T. Ames purchased the lot to the east, with a 48 foot frontage, from William Gaston. On June 19, 1873, he sold the eastern portion of the lot, at 321 Marlborough, with a 22 foot 3 inch frontage, to Herbert E. Barney, a builder who probably was constructing both 321 and 323 Marlborough under an agreement with Samuel Ames. Samuel Ames retained the western portion of the lot, where 323 Marlborough was built with a frontage of 22 feet 9 inches. 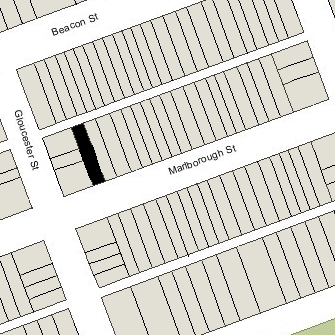 On August 1, 1873, he sold the remaining 3 feet to the west to the owners of the three houses at 3-5-7 Gloucester, who thereby increased the depth of their lots from 54 feet to 57 feet. All of the land on which 321-323 Marlborough and 3-5-7 Gloucester were built was part of one of several parcels originally purchased from the Boston Water Power Company on January 29, 1866, by a real estate investment trust formed by John Templeman Coolidge, Franklin Evans, and Charles Henry Parker. The trust had subdivided the property into lots, which it sold to investors and builders, who then frequently resold the lots to others. Click here for an index to the deeds for 323 Marlborough. On September 22, 1874, 323 Marlborough was purchased from Samuel T. Ames by real estate dealer William Boynton. He and his wife, Augusta S. (Morse) Boynton, lived in Winchester. On May 26, 1876, Arnold Kendall, who held a mortgage given by William Boynton, foreclosed and took possession of the property. On May 31, 1876, 323 Marlborough was acquired from Arnold Kendall by Mary Elizabeth (Wells) Morss, the wife of wire and cable manufacturer Charles Anthony Morss. They previously had lived at 45 East Springfield. The Morss’s four surviving children — Charles Anthony Morss, Jr., John Wells Morss, Everett Morss, and Henry Adams Morss – lived with them. Miss Martha Elizabeth Wells, Mary Morss’s first cousin, once removed, also lived with them. She was the daughter of Richard and Sally (Pritchard) Wells; Richard Wells was the son of George Wells, the brother of Mary Morss’s father, John Wells. Everett Morss married in June of 1891 to Ethel Reed and they moved first to the Hotel Royal at 295 Beacon and then (in 1895) to 303 Marlborough. He later would become president of his father’s wire and cable manufacturing firm and would serve as treasurer of MIT. Charles Morss, Jr., married in May of 1893 to Martha Houghton Reed and they moved to 6 Gloucester. He later would become treasurer of his father’s firm and also would serve as a governor of the Federal Reserve Bank in Boston. Ethel (Reed) Morss and Martha (Reed) Morss were not closely related. Ethel Reed was the daughter of Dr. Guilford Shaw Reed, a dentist, and Ella Pauline (Berryman) Reed; Martha Houghton Reed was the daughter of James Henry Reed, treasurer of the Boston Ice Company, and Martha Ann (Wesson) Reed. James and Martha Reed lived at 3 Gloucester. In June of 1899, 7 Gloucester (to the west of 323 Marlborough) was purchased by Elizabeth (Russell) Haskell, the widow of Francis Hathaway Haskell. She planned to build a two story rear addition, using the western half of the wall at 323 Marlborough as the rear wall of the addition. To facilitate its construction, on August 25, 1899, Mary Morss sold her a six inch strip of land 22 feet wide (north-south) with the western half of the wall of 323 Marlborough on it, and they agreed that, thereafter, that portion of the wall would be considered a party wall between the two houses. Charles Morss, Sr., died in July of 1903, and Mary Morss continued to live at 323 Marlborough with their unmarried sons, John Wells Morss and Henry Adams Morss, and her her cousin, Martha Wells. Henry Morss married in March of 1909 to Edith Sherman and they moved to 463 Commonwealth. He was vice president of his family’s wire and cable firm. John Wells Morss did not marry and continued to live with his mother. He was an attorney and (like his brother, Charles) would later serve as governor of the Federal Reserve Bank of Boston. Mary Morss died in December of 1909. 323 Marlborough was inherited by her four sons, and on October 11, 1910, Charles, Everett, and Henry Morss conveyed their interests in the property to John Wells Morss, who continued to live there with his cousin, Martha Wells. In about 1910, they were joined by Miss Clara E. Littlefield. She was Mary (Wells) Morss’s niece (and therefore John Wells Morss’s first cousin), the daughter of Samuel Storer Littlefield and Hannah (Wells) Littlefield, Mary (Wells) Morss’s sister. 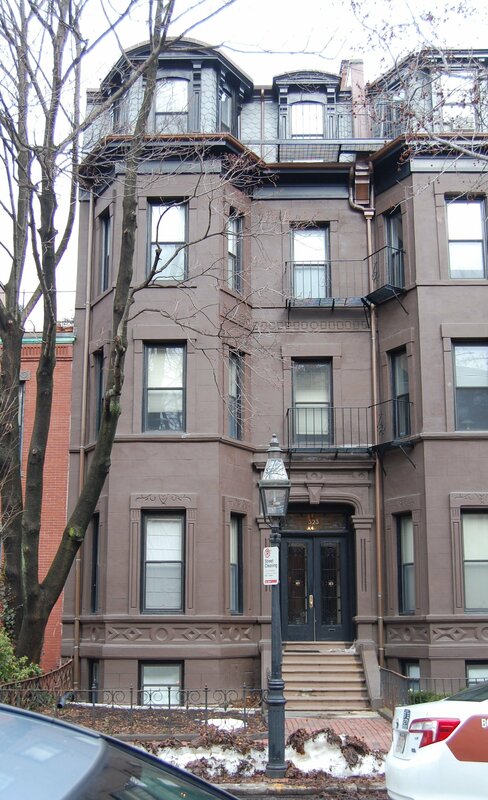 Clara Littlefield continued to live at 323 Marlborough during the 1912-1913 winter season, but moved thereafter. By the 1913-1914 winter season, Lewis Kennedy Morse, a lawyer, was living at 323 Marlborough with John Wells Morss and Martha Wells. He was a widower and previously had lived in Cambridge. He continued to live at 323 Marlborough during the 1915-1916 season. In July of 1916, he married again, to Ednah Anne Rich. 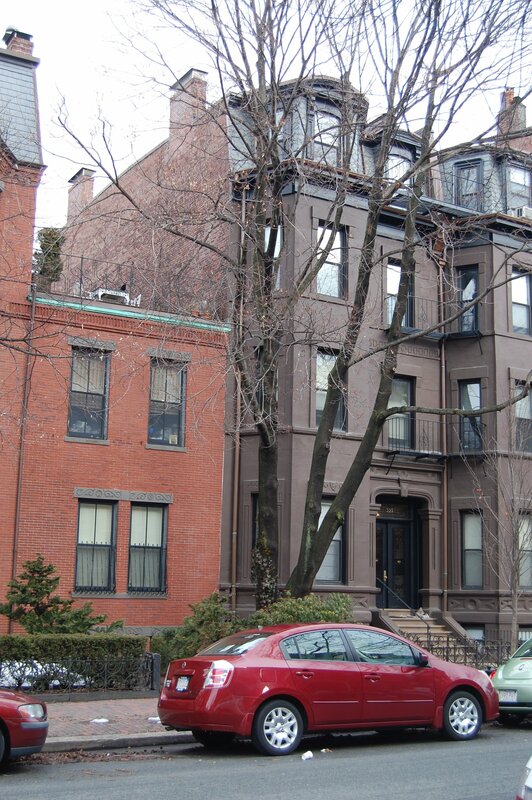 After their marriage, they lived at 279 Marlborough. During the 1916-1917 winter season, Dr. William F. Bade was living at 323 Marlborough with John Wells Morss and Martha Wells, probably William Frederic Bade, a professor at the Pacific School of Religion in Berkeley who was a close associate of naturalist John Muir and served as his literary executor. Martha Wells continued to live at 323 Marlborough through the 1916-1917 winter season. John Wells Morss continued to live at 323 Marlborough until his death in June of 1939. 323 Marlborough was shown as vacant in the 1940 City Directory. On June 5, 1940, 323 Marlborough was acquired from John Wells Morss’s estate by Russell B. Allen of Lexington, a building construction contractor, and on June 26, 1940, it was acquired from him by Bertha Alfreda (Duff) Goodhue, the wife of Robert Wadleigh Goodhue, a pressman with the American Record Advertiser. They operated it as a lodging house. They previously had lived at 346 Marlborough, where they also had operated a lodging house. On November 6, 1942, Bertha Goodhue transferred the property into both of their names. 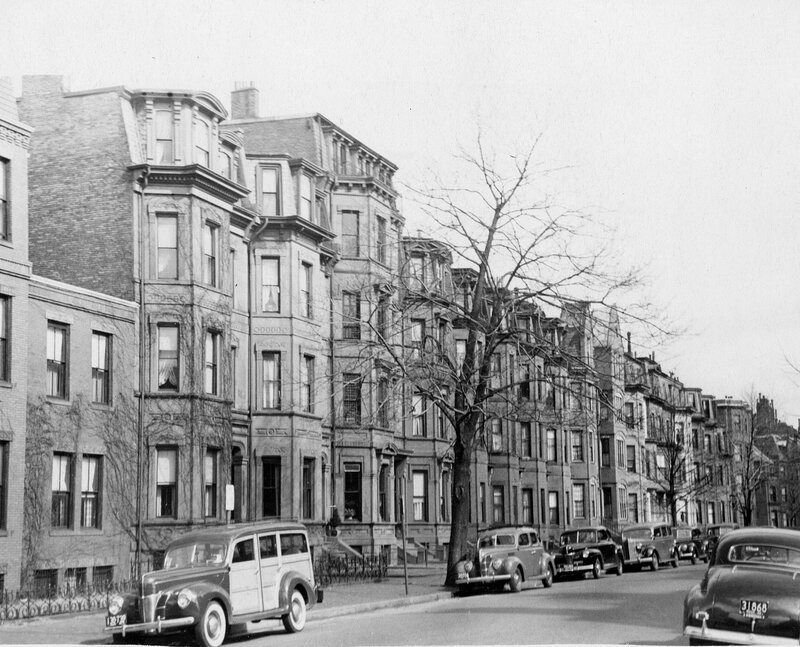 The Goodhues continued to live at 323 Marlborough, and to operate it as a lodging house, until about 1944, when they moved to an apartment at 288 Commonwealth. On July 1, 1944, 323 Marlborough was acquired from the Goodhues by Felicidad (Martinez) Perez, the widow of Angel Perez, who continued to operate it as a lodging house. She previously had lived in New York. She continued to live and operate a lodging house at 323 Marlborough until about 1960. In February of 1960, the trust applied for (and subsequently received) permission to convert the property from a lodging house into ten apartments. The property changed hands and on September 7, 1960, was acquired by the Copley Realty Corporation. On June 28, 1965, it transferred the property to Edward Swartz, its president and treasurer. On July 8, 1965, 323 Marlborough was acquired from Edward Swartz by David C. Walker, trustee of the Three Twenty Three Trust. In December of 1965, he acquired 321 Marlborough. The property changed hands, with 321 and 323 Marlborough continuing to be owned by a single owner, and on June 20, 1969, they were acquired by Margaret E. (Gardner) Fleischhacker, wife of real estate dealer Rudy Joseph Fleischhacker, as trustee of the Margaret Realty Trust. On July 14, 1975, the Workingmens Cooperative Bank foreclosed its mortgage to Margaret Fleischhacker and took possession of 321 and 323 Marlborough, and on August 25, 1975, the properties were acquired from the bank by Allan M. Haven and Miriam S. Haven. On February 29, 1984, 321 and 323 Marlborough were acquired from Allan and Miriam Haven by Anna Keliher, trustee of the 321-323 Marlborough Street Trust. 321 Marlborough remained an apartment building in 2017.